I'm a little crabby today. In knitting life some crabbiness is coming from the large numbers of baby things I've been knitting. I can't wear them and neither can the baby because she isn't born yet. This is sterile knitting. I have a baby sweater on the needles and plans for one more, and that's it for a while. Some extra crabbiness came to me courtesy of Elizabeth Zimmerman. Although I own all of her books except for The Opinionated Knitter, I have always harbored a slight aversion to her. Now I know why. The pattern she published for this design in The Knitter's Almanac is mean and nasty. There are no other words for it except maybe stingy and mingy. Here is the design. First of all its author doesn't bother to tell you what size this pattern makes. She only tells you to knit at a gauge of 5 stitches to the inch. She also fails to tell you what pattern to use when measuring your gauge. So I guessed and measured the gauge in stockinette stitch and got 5 stitches to the inch. I used DK weight yarn and # 7 needles; EZ gives no suggestions as to yarn weight. The result is a sweater for a gigantic baby, or perhaps, a toddler sweater. It measures 26 inches wide and 14.5 inches long. In her verbal stinginess, Zimmerman includes this helpful instruction: "Place remaining 92 sts on needle, knitting up 4 x 7 sts at the cast-on sleeve-sts...." Of course she has never told you to place the stitches on a holder in the first place, and how do you "knit up 4 x 7 sts"? As an experienced knitter I and others like me were able to follow these obscure directions. But if you are inexperienced, run the other way. And I will point out that in 1974 when The Knitter's Almanac was published, there were well-established pattern-writing conventions that knitters expected to see in published patterns, with good reason. So much for the knitting directions. As for the design, I call it quaint. I mean by that antique or vintage, but not in a good way. I take some of the blame for that. I liked the design in its many Ravelry incarnations, but now I see that many Ravelers did what I did not do. First, many used shades of red and purple which, for some reason, is the best color for this design. Second, many did not decrease stitches along the bottom edge as the designer instructed. The swingy look they get as a result is more modern. 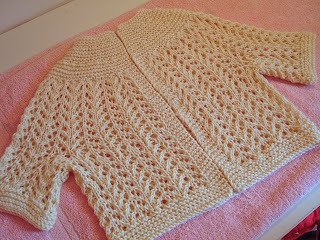 By decreasing the bottom and using yellowish white I got the most Victorian-y version possible of this nameless sweater. On a positive note, I am fascinated by the one-piece construction of this garment although I fear that underarm comfort may have been sacrificed as a result. I am also grateful for the gull lace pattern. It is soothingly easy to knit and would be pretty for a scarf, wrap, or blanket. I named my sweater Temptation after the book I listened to while knitting, The Last Temptation, a thriller by by Val McDermid. And also because I was tempted to make this sweater against my better judgment by the cleverness of its construction. Elizabeth Zimmerman missed her calling as an engineer. This sweater is going to charity. All in all I don't like it and don't want to see it again. I admire your bravery in daring to criticize such an icon of knitting as EZ. I have never purchased any of her books, etc., nor tried any of her patterns/strategies, and have always felt that somehow I "should." Because she's famous. And because everyone loves her stuff. But now I feel better. I too love how you can speak your mind. I have had great success with some EZ "patterns", much less with others. The baby cardigan looks very dear to me but I understand the issue with white. I had the same frustration with a lace scarf attempt not long ago and came to realize that particular pattern just wasn't going to work in white. Ravelry is a great help in analyzing why some knits just flop. I am not an EZ fan, either. The projects look great, and their construction is frequently intriguing, but like you, I am put off by the lack of detail in the instructions. The sweater is lovely. Kudos!